Anyone who has seen a magician ply his trade understands the use of misdirection to confuse and baffle the audience. The flourish of the cape and wand captivate the watchers’ eyes so they will not see the false bottoms, mirrors, and devices hidden behind the curtain. This lesson has been well-learned by the world’s arrogant elitists whose goal is one world governance, one world currency, and the elimination of all private property (except theirs) under the umbrella of the UN’s Agenda 21. They know that few Americans would willingly give up their vehicles, pets, their 3 bedroom/2 ½ bath home on 2 acres, and their suburban lifestyle to live in a cramped 2 bedroom/1 bath apartment in an inner city high rise. Participating in a UN advocated planning process would very likely bring out many who would actively work to defeat any elected official undertaking Local Agenda 21. So we will call our process something else, such as Comprehensive Planning, growth management, or smart growth. Preemptively and deliberately, they did indeed grab all the “good” words: Sustainability, consensus building, common future, biodiversity, smart growth, social equity, food justice, social justice, mixed use development, transit corridors, bike lanes, urban sprawl, riparian buffer zones, farmland preservation, and pedestrian oriented development, to name a few. Those who dare to oppose any of these socialist initiatives are forced into the untenable position of favoring ideas and programs that sound truly evil regardless of their actual intent. If you are against “social justice”, for instance, you must be for “social injustice”. If not “smart growth”, are you for the opposite? The Public-Private Partnership (P3) is yet another ruse of big government to steal your wealth and private property and, in the process, “fundamentally change America” and plunder the productive members of society. A P3 is the essence of fascism and crony capitalism, elected government officials and their bureaucracy favoring corporations who support the political agenda of the ruling class, so both can profit at the expense of our individual freedom. Vallee Bubak, my guest on Freedom Forum Radio in a three-part interview that begins this weekend (Saturday/Sunday, September 7 and 8), is on a crusade to educate the public about Public-Private Partnerships (P3s). Her current focus is the P3 involved in widening Interstate 77 north of Charlotte, NC. The following is a synopsis of her arguments against this project. I-77 only needs 13 miles widened with a general purpose lane in each direction, a project that would cost $80 – $130 million and would not require any bridges to be rebuilt. Instead, under a P3 proposal, the public is being pushed into a 27.5 mile project that includes the unnecessary rebuilding of nine bridges, a flyover to connect two highways, managed toll lanes, and the relocation of homes and businesses at the estimated cost of $550 million. Even though the public is almost unanimously opposed to it, the organizations and corporations that stand to profit from the restricted toll lanes actively fund the campaigns of the elected officials who vote in favor of the expanded project. These private companies work in partnership with the government, funding media campaigns to manipulate and dupe an unsuspecting public. The toll lanes use dynamic managed pricing in which cars using the lanes are monitored by video cameras or by on-board sensors. Monthly bills are generated based on miles driven, and rates vary during peak and off-peak hours. 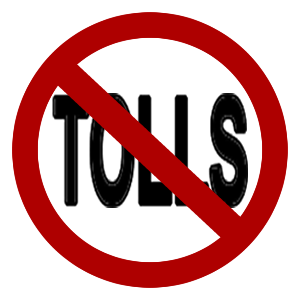 50 – 70 year term, newly elected officials cannot eliminate the tolls even if elected to do so. In the big picture, these projects are designed to alter the American way of life. Taxpayers who have paid to construct more highway lanes now find themselves sitting in worse congestion than before. Their choice is to sit in traffic or pay the tolls. Either way, the price of their commute has increased. Eventually, especially if all the good corporate jobs are located in the city, they are forced to use public transportation or relocate into the city, both of which are among the stated goals of Agenda 21 (walkable inner-city communities, public transportation only, light rail, no private automobiles, an end to urban sprawl, controlled distribution of food and water, etc.). Using video or on-board transponders to track cars also allows the government to know exactly where you are any time you drive on a monitored road. The end result is the complete loss of true individual freedom and total control over every aspect of the life of each citizen – the ultimate goal of all totalitarian governments so well depicted by George Orwell in his epic novel, 1984. Don’t miss this provocative and critically important three-part interview. Dr Dan and Vallee Bubak (of P3 Times) discuss in depth the risk to individual freedom posed by Public-Private Partnerships and suggest methods we can use to fight this insidious trend toward Regionalism and the loss of our American way of life. Part I will air this weekend, September 7 & 8, Part II will air September 14 & 15, Part III will air September 21 & 22. Click HERE for dates and times. Vallee Bubak is a conservative, Republican from Mecklenburg County, NC, who has been fighting the implementation of toll roads. She has been working with local grassroots organizations such as WidenI77 and TollFreeNC to inform the public and legislators about the nationwide agenda to turn existing taxpayer highways into public-private partnership (P3) toll roads. Born in Grand Junction, CO, Vallee grew up in California and later worked in Silicon Valley, where she climbed the corporate ladder in public relations. She and her husband then lived in Colorado for 8 years before realizing their dream of settling in North Carolina to raise their children and someday retire. Upon moving to North Carolina, Vallee continued her passion for politics in the Republican party. In December of 2012, when the issue of the toll roads was presented at a Republican women’s meeting, Vallee joined with other local activists in the effort to stop the NCDOT’s plan to toll existing highways. That battle led to the discovery of how public-private partnerships were being used nationally to take over public infrastructure. Vallee has recently started a website called P3 Times. It is a resource for anyone wanting to learn more about public-private partnerships. As she made the rounds in talking with the media about toll roads, she has also been critical of another public-private partnership – Obamacare. Vallee has been relentless in her efforts to protect the people of North Carolina against P3s – whether they be Obama’s infrastructure plan called Partnership to Rebuild America or Obamacare – and our Republican leaders aiding these progressive agendas. Thanks Dr. Dan, We the public desperately need for you to help educate us to what our elected officials are attempting to do. Lowell – as always, I appreciate you taking the time to read and comment. The list of issues seems to grow larger every day. A never ending battle to restore limited, constitutional government, but I’ll never give up! was the lone NO vote opposing the Clean Water Act which began the implementation of Stream Buffers throughout the State. I appeared in public forums throughout the western half of our State to convey what this legislation was to accomplish. I was essentially ridiculed as being a “kook”. Money came from the majority of States in the U S in the general election of 1998 to defeat me which was successful. Every person should go to the net to THE TURTLE ISLAND websites to read what you and many others are now conveying. “So right here Dan. We no longer have free markets but pure crony capitalism for the multi-national corporations and investment banks. The small business operator is under pressure from regulation and excessive taxation. 90% of the country is sliding backwards toward poverty as fewer and fewer control the economic game generated from Washington. War is now decided by a few even when the vast majority oppose more foreign wars. We are bankrupt from any normal accounting standard yet we have a Congress that acts as if we have an unlimited checkbook. Let them sell and buy war bonds if they want this Syrian war so badly. They will find that there is no stomach for it. Who wants to fight for the Muslim Brotherhood other than the stooges is Washington. This war is more about a higher debt ceiling and a Russian nat. gas pipeline through Syria to the Mediterranean Sea for exporting. OPEC would be threatened by this nat. gas and if OPEC is threatened then so is our almighty dollar cause all we have is a petro dollar with no gold backing. God Bless. ?